Weight is 565 grams (more then 1/5 kilo) / 19.93 ounces. 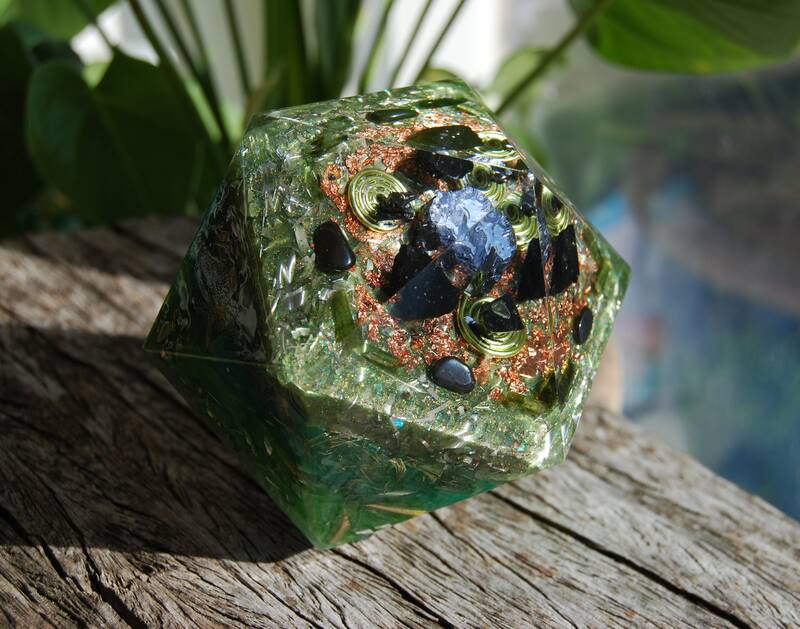 This is a unique Orgonite® in the shape of a Icosahedron in which is laid a special crystal grid. It consists of densely layered metal shavings of aluminium, bronze, copper and brass which is required to for the Orgonite® to properly work according to Wilhelm Reich's research (the more METAL Shavings, The better the Orgonite® can remove stagnant energy 🙂). In the top middle lays a raw Galena which is surrounded by three green coils that each have a piece of Elite Shungite on top and black Tourmaline is in between. The outercircle consists of raw green Tourmaline with Hematite. Under this crystal grid is leaf copper. Within the metal layers there are five terminated quartz crystals pointing in five directions for extended energy flow in all four directions and for piezo electric effect. 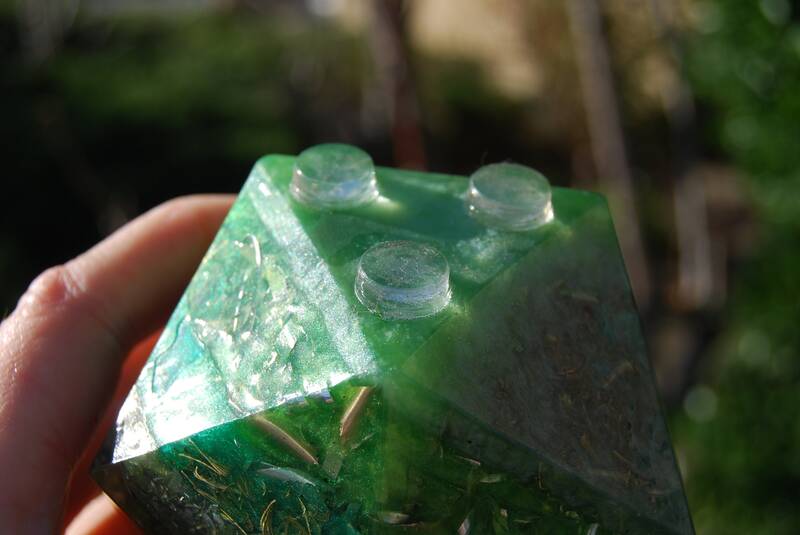 It is made out of durable polyester resin (so not epoxy resin which doesnt shrink) to ensure optimal shrinkage and pressure on the quartz to create the most piezo electric effect. It is handpolished on the sides so it is smooth and shiney. Galena is the principle ore of lead. Galena provides grounding and enhances the centering of one’s energies. It is a stone of harmony, stimulating interaction on all levels, and assisting in the decrease of self-limiting ideas. Promotes holistic, homeopathic and herbal medicine studies. Galena used to open pathways between the physical and ethereal bodies in order to allow for the alignment of energies and the stimulation of the nervous system. Physically, Galena can assist in the detoxification process. Galena may also be used to reduce inflammation, enhance circulation and ease joint pain. Green Tourmaline is the expression of abundant health and vitality, thus can help one improve energy levels. The green tourmaline can also heal specific imbalances such as timidity or an energetically closed heart / inability to connect to other human beings. Green Tourmaline has a lovely vibration that stimulates happiness and joy for life! Its metaphysical properties strongly promote compassion... particularly towards yourself. 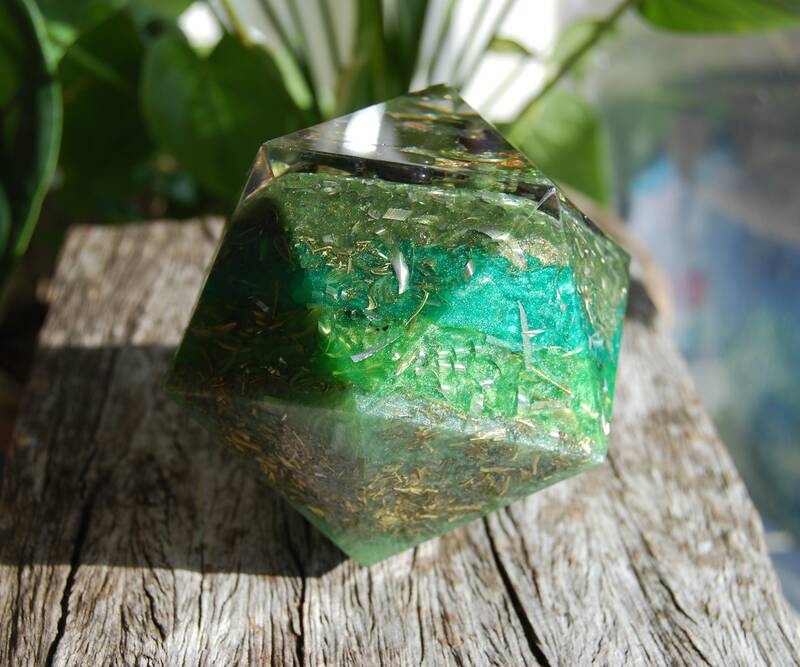 This delightful green crystal is an earth energy stone. It will connect you to the earth and attune you to the vibration of Mother Gaia. Its gift of allowing your heart to make an electro-magnetic connection with the earth itself, will help to improve the health of the physical heart. It has a strong healing capacity... and is especially helpful for earth healing and aiding the nature kingdom. This is strong stone to aid you to gain a greater understanding of the flow of energy between the mineral and plant kingdoms. It is one of the best stones to use against EMF, and repels all kinds of negative energy. It is extremely valuable during times of stress and crisis, and helps strengthen the immune system. Quite a strange stone indeed, Hematite is sold as a heavy, silvery metallic black luster and bulbous shape, with an inner core stained the color of blood. So, there’s real hematite (non-magnetic) & then there’s Magnetic Hematite (FAKE). Natural Hematite is not naturally magnetic. There’s a very small little magnetic charge in natural hematite, but nothing you’d be able to feel. Hematite is an excellent stone to have with one when being bombarded with multiple energies of people, stones and crystals or environmental substances as it will attract, negate, and dissipate negative energies from all around. Hematite clearly has a very strong grounding energy; you can feel that just by holding the stone in your hand. It also has a cooling and calming effect, as well as helps develop concentration and focus. Overall, hematite brings a quality of energy that is powerful, strong and grounding. It works with one's mind by calming it and clearing the unnecessary clutter . They also have a profound effect on clearing the Heart, and working on the Solar Plexus, to provide empowerment and manifestation of Will. With their amplifying effect, they can greatly assist with helping one to manifest their intents in the physical realm. Rhodizites also elevate mood by bringing high frequency energy into the emotional body, creating a sense of bliss, joy, and upliftment. They create a purification process that helps to put the body in harmony and balance, and also clear the path for Lightbody integration. 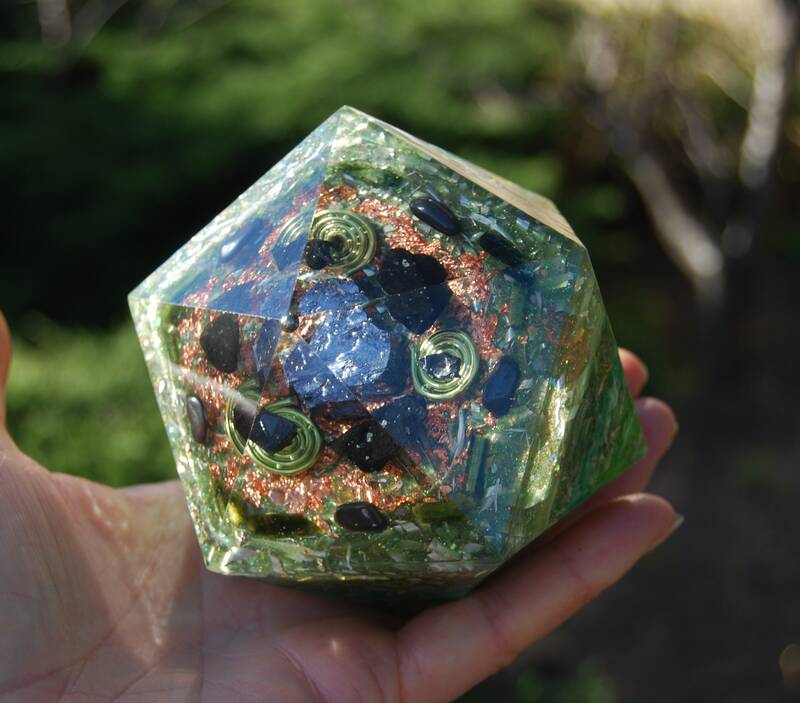 This Icosahedron consist primarily of concentrated organic matter in the form of resin; inorganic matter in the form of metals; and conductors in the form of one clear ore more clear quartz crystals. The organic resin exerts negative ionic charges and the inorganic metals exert positive ionic charges. When housed in such close formation, the excitation of these ionic charges act as magnetic energy generators (orgone) - drawing in subtle energies from the environment. In combination with clear quartz crystal(s) and other semi-precious stones, these magnetic energy generator devices continuously transmute (on a quantum level and in elegant scalar resonance) lower incoherent energy drawn in from the environment into higher coherent frequencies inherent in the crystalline signatures of the stones. These higher frequencies are continuously generated, transmitting vibrations of harmony & balance out into the environment and into one's energy fields. 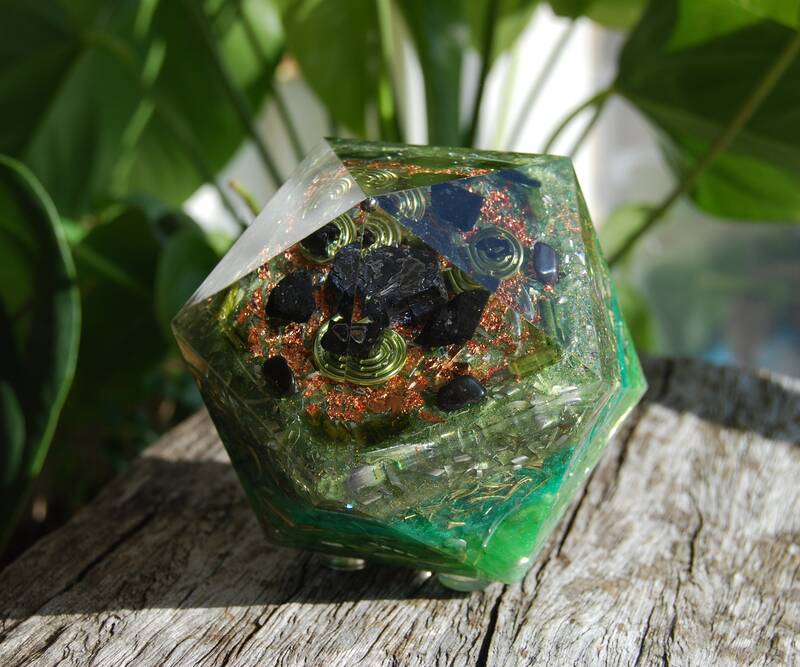 Karl Hans Welz is the inventor of Orgonite® and Orgone Generator® and owns the registered Trademarks. 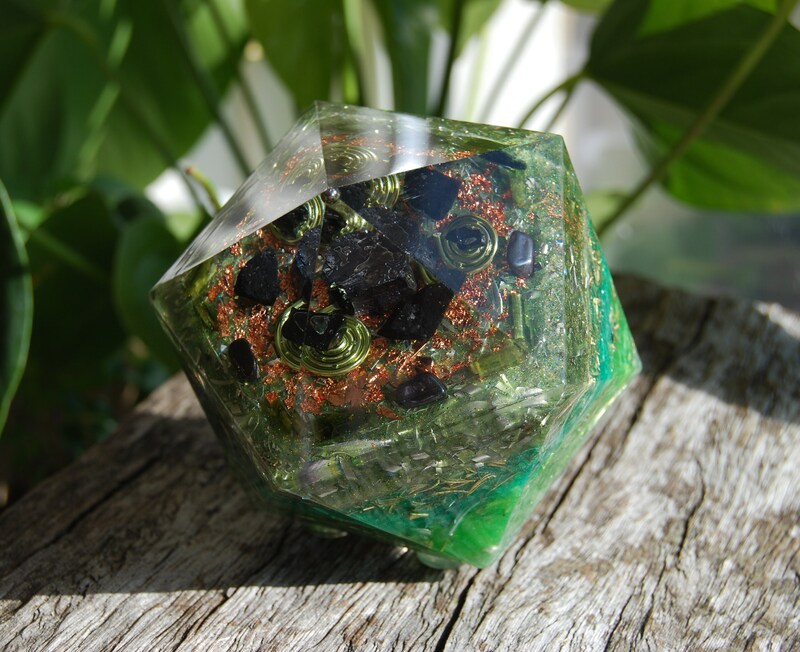 I have his written permission to use the term Orgonite® and Orgone Generator®. Dr Wilhelm Reich, an Austrian psychiatrist, researched orgone energy in the earlier half of the 20th century. 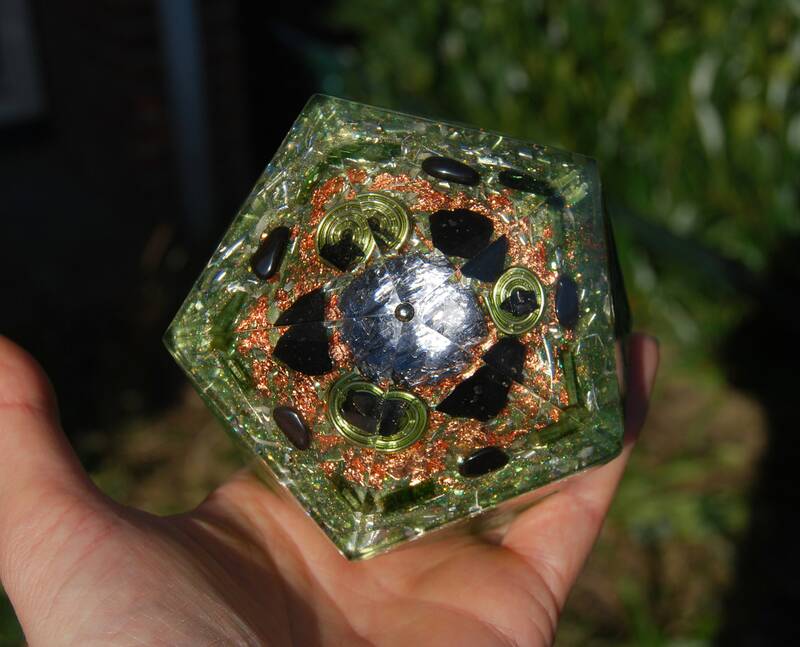 He found that organic materials attracted and held orgone energy, while non-organic metal materials attracted and rapidly repelled orgone energy. Today’s orgone devices are built on these two principles. 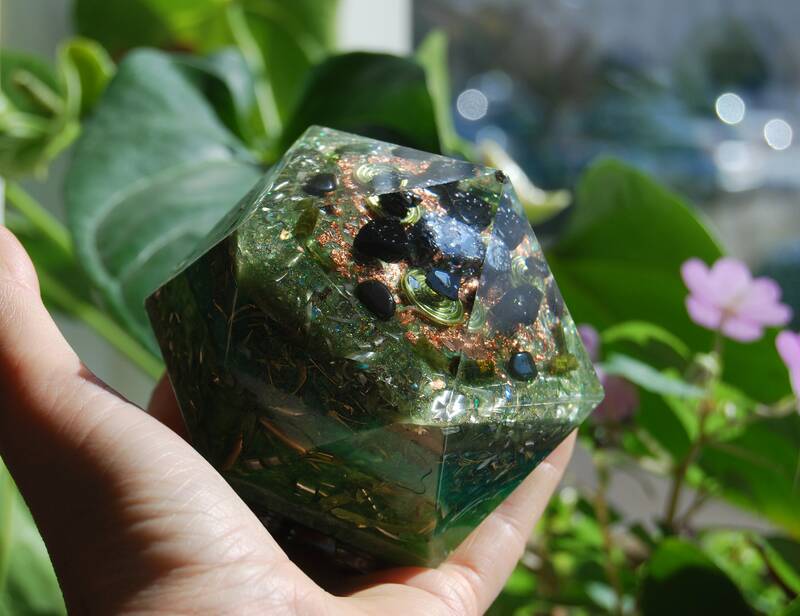 As a mix of organic resin and inorganic metal shavings, they simultaneously attract and repel stagnant orgone energy, producing a “scrubbing” effect which re-charges the stagnant energy. 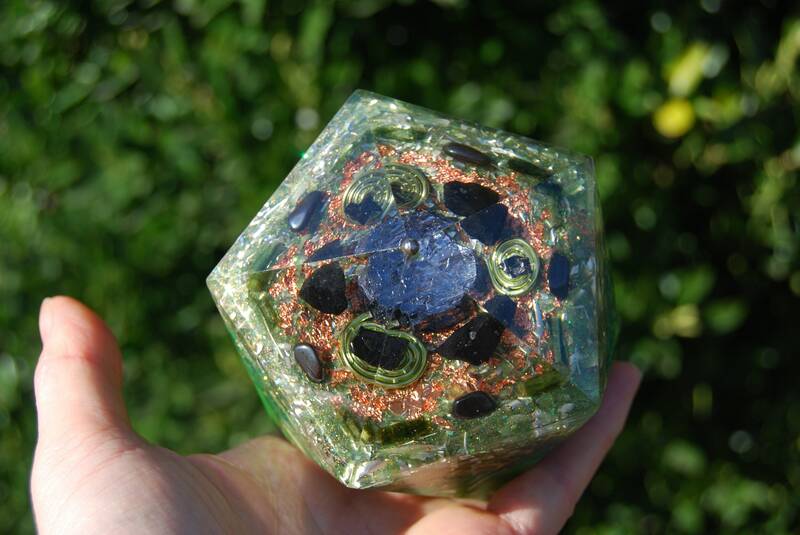 Orgone devices also includes an encased quartz crystal which has a piezoelectric effect (it produces a small electric charge when put under pressure). This adds to the energy-cleansing effect. 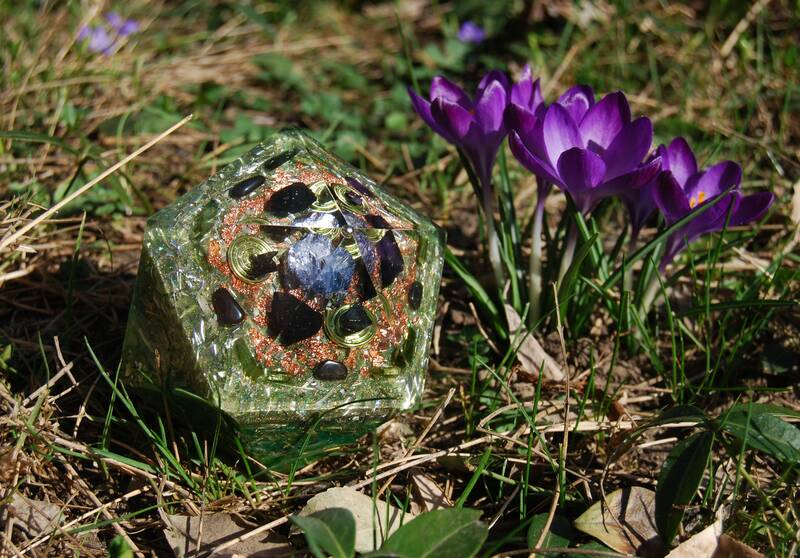 This Icosahedron is created with loving intent to transform people’s lives for the better in a loving environment. It has been hand sanded through sets of fine polishing paper so it is smooth. Weight is 565 grams / 19.93 ounces. Made with love 💚🙂. Will be shipped with Trackingnr. 🚀🌎.